To learn how to access these settings and configure your keypad, see the Configuration section. 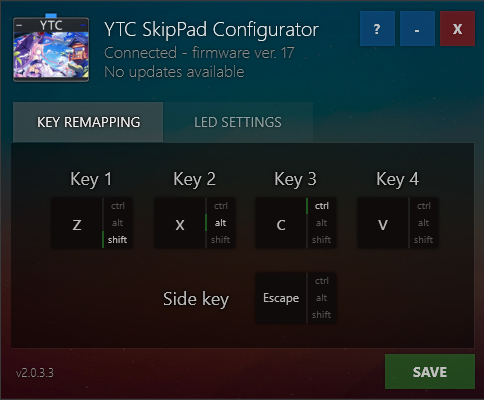 There are two main sections of your keypad’s settings: key remapping and LED settings. This section is to remap the default keys to other printable characters. Keys are ordered left-to-right, starting from Key 1, located next to the USB port on your keypad. Side key (key 0 in the manual setup menu) is the small pushbutton on the other side of your keypad. In addition to remapping the character bound to each key, you can make the keypad press any combination of CTRL, ALT and SHIFT along with any selected key. To do this, simply click any of the corresponding labels next to the boxes with a key bound. This section is to customize the LED settings. Mode: The animation the LEDs should display in relation to an action. 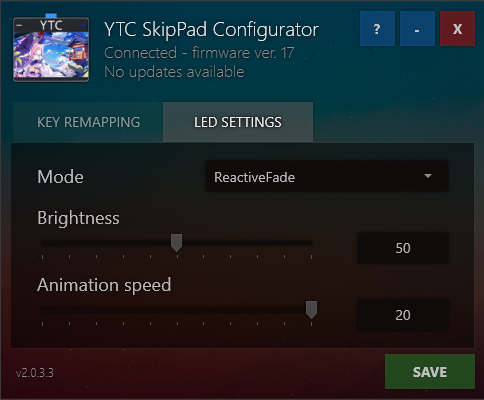 Off: LEDs are always off and will not react to anything. On: LEDs are always on and will not react to anything. Reactive: LEDs will flash on when key pressed and turn off when button released. Reactive (flip): LEDs will flash off when key pressed and turn on when button released. Breathe: LEDs will fade on then off.